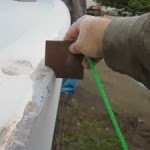 Bubba the Pirate: Glassing the gunwale. There is a confidence, a sort of comfort, in doing something you've worked hard to be able to do. I've just completed my third week at the hospital. 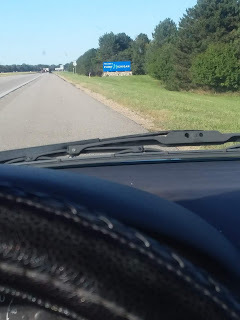 I am so thankful to have found such a great place to be. My new coworkers in the pharmacy are great. The job is interesting and ever changing. Working for a nonprofit community hospital is surprisingly enriching. Without being on the front lines of directly caring for patients, it is an honor to be a part of helping people. The work feels more like an extension of me than just something I do. There is a natural ease as if everything is coming together. This new togetherness extends as well to the hull and deck of my boat. 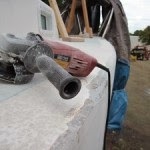 Last fall, I ground a one inch radius at the gunwale; where the hull and deck meet. Cape Dory had screwed the deck to the hull at about 8" on center, but I wanted a stiffer joint. This weekend, and last, I've finally been glassing over my radius. 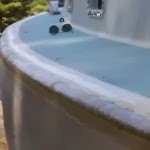 2" fiberglass tape followed by 3", 4" and 6" - about 65 feet in each layer by the time I got around the curve of each side of the hull. There will be lots of fairing to do, but the long curve looks good actually. I'm happier with the results than I had hoped to be. The chainplates will be moved outward to external rather than through the deck. Also, I have designed a floating toe rail similar to Fred Bickum's Fenix. Any wave over the deck will have an unimpeded flow to go under the toe rail and off the boat. Another project on the near horizon is to glass over the two large, aft most, cabin hatches. This will allow me to re-drill and cut a hole for a somewhat smaller portlight, but one that will match the other six I installed last year. For now, these old bones are tired. I am feeling your positive energy!